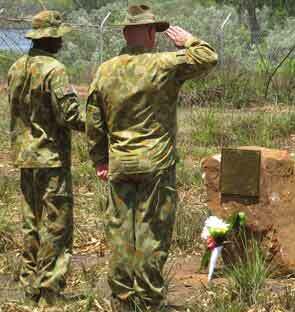 It was on 27 September 1943 that the world war became a hideous reality at the Drysdale River Mission, Kalumburu. Japanese war planes bombed and strafed the clearly marked Mission buildings, killing six, one man, one woman and four children including the Mission Superior Fr Thomas Gil OSB. 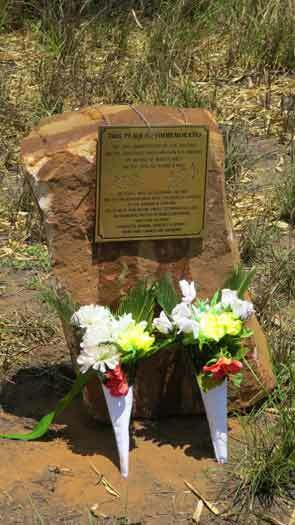 To commemorate the 70th of the event, the Kalumburu community gathered on Thursday 27 September 2013 at which two plaques were unveiled and blessed. 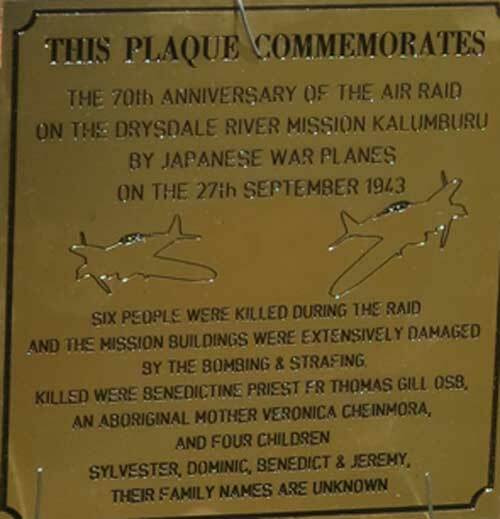 This Plaque Commemorates the 70th Anniversary of the air raid on the Drysdale River Mission Kalumburu by Japanese war planes on the 27 September 1943. Six people were killed during the raid and the mission buildings were extensively damaged by the bombing and strafing. Killed were Benedictine priest Fr Thomas Gil OSB, and aboriginal mother Veronica Cheinmora and four children; Sylvester, Dominic, Benedict and Jeremy, their family names are unknown. This plaque commemorates the 70th Anniversary of the air raid on the Drysdale River Mission Kalumburu by Japanese war planes on the 27 September 1943. This Church, completed in 1936 and dedicated to Our Lady of Assumption was seriously damaged during the raid. The church, rebuilt by Fr. Rosendo and Kalumburu aboriginal workers stands in memory of those killed in the raid. 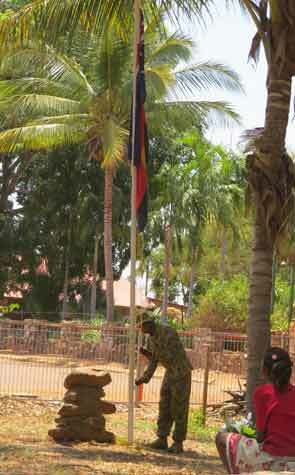 You can read all about Kalumburu Mission’s involvement in the war in the museum.